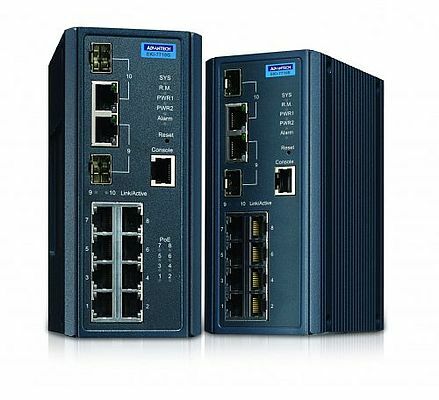 IXM from Advantech provides engineers with the ability to assign a fixed range of IP address to many devices at the same time, and also provides them with the ability to simultaneously copy the same switch configuration across multiple switches. Once the 'master' has been configured, IXM can be launched and within seconds all other IXM compatible switches will be populated with the same settings. This function saves up to 90% of the configuration time not only speeds up the configuration but also ensures that mistakes aren't made. The latest trend in modern industrial environments is the fast deployment and flexibility of a networking topology. Upgrading firmware and setting the configuration of a large number of devices is a challenging job for both IT and SI (System Integrator) professionals. As a global leader of industrial networking technologies, Advantech is pleased to introduce the world's very first series of Managed Ethernet Switches to make networking deployment and configuration more efficient. IXM technology on the EKI-7710 is the solution to fast network and configuration deployment. IXM technology for EKI-7710 series switches provides a cross management and fast deployment function allowing switches to upgrade their firmware and restore configuration more efficiently. In order to allow more rapid networking deployment, IXM technology supports both mass firmware upgrades and flexible configuration restoration via a web GUI.